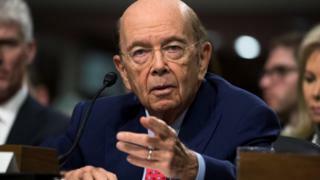 The Trump administration's top trade priority is to renegotiate the Nafta trade deal with Canada and Mexico, according to commerce secretary nominee Wilbur Ross. He was speaking to US senators at a confirmation hearing on his nomination. Mr Ross said China was the "most protectionist" country among large economies. But "Nafta is logically is the first thing for us to deal with," he said. "We ought to solidify relationships in the best way we can in our territory before we go off to other jurisdictions. "That should be, and hopefully will be if I'm confirmed, a very early topic in this administration," said the 79-year-old billionaire. During the recent US presidential election campaign, the President-elect, Donald Trump, bitterly criticised both Nafta and trade deals with China. Mr Trump said both were responsible for the erosion of millions of US manufacturing jobs. He promised he would renegotiate Nafta to make it more favourable to the US companies or withdraw from the 23-year-old pact. Mr Ross told the Senate committee: "I am not anti-trade. I am pro-trade." He added: "But I am pro-sensible trade, not trade that is to the disadvantage of the American worker and to the American manufacturing community." And he suggested that counties that "violated" US standards for free trade should be "severely punished." With regard to China, Mr Ross said he would try to cut that country's high tariff and non-tariff barriers to trade. "We would like levelise that playing field and bring the realities a bit closer to the rhetoric," he added. "It's a little weird that we have very low tariffs and China has very high tariffs. That seems to me to be a bit of an imbalance." He told the senators that Chinese officials talked much more about free trade than they actually practiced. "So I think a lot of what we need is elimination of inappropriate and in most cases improper trade barriers to us," he said. "I think American ingenuity, American management and American labour can compete very, very effectively if it's a fair fight. In a lot of cases it's not a fair fight." Mexico and Mr Trump: What will happen to trade ties?